Every Tuesday from 6-8 we meet to work on bikes, talk about bikes, and simply hang out in a space that everyone who identifies as W/T/F Non-binary feel welcome and comfortable. 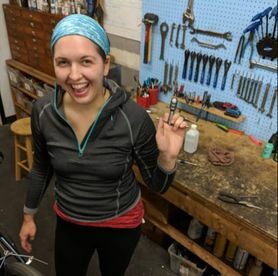 The Bike Library is committed to building a culturally diverse volunteer base and strongly encourages POC, non-binary, W/T/F folks from the public to take advantage of the public programs we offer. We also hope that W/T/F folks will consider volunteering at the Bike Library and be a part of getting more folks in Johnson County on bikes.